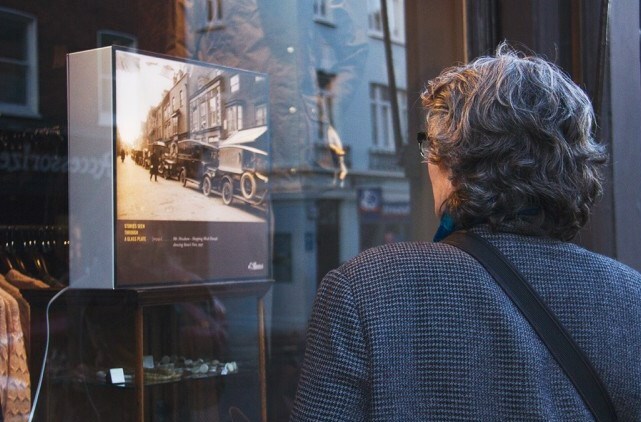 We hope that you have seen and enjoyed the current Stories Seen Through a Glass Plate exhibition of 80 photo lightboxes in 55 of our shop windows in Lewes, featuring plates from the Reeves archive. Lewes resident Brigitte Lardinois, curator of the lightbox exhibition, will be giving a talk on this project as a Friends of Lewes event on Thursday 15 January 2015, at Lewes Town Hall. We will provide more details soon, but mark your diaries now. This wonderful display is a precursor to a much more substantial effort to digitise the Reeves archive and records and make them more broadly available. The broader project is dependent on a successful Heritage Lottery Fund grant application. These applications have a much greater chance of success if community support and interest can be demonstrated. If you’ve seen and enjoyed the current shop displays, you could email Brigitte at info@reevesarchive.co.uk and express your appreciation and support. Alternatively, it would be fine to just drop a note off at Reeves in the High Street – which is also putting on an exhibition of the history of their studio on Thursday, Friday, and Saturday afternoons until 2nd November. The lightbox exhibition runs from 4th October until the 2nd November. See the project website for more details.